We encourage everyone to learn about the democratic process in Ontario. Our outreach activities include providing educational resources about voting in Ontario, and participating in events to promote active civic engagement for all Ontarians. Subscribe to our outreach newsletter to stay informed. Find out more about the electoral process in Ontario with our educational resources, request a presentation or contact us about an event. During the fall of 2018, the Outreach team submitted an application to be considered by the International Center for Parliamentary Studies (ICPS) for their First-Time Voter Award. The ICPS is a global agency dedicated to democratic engagement and electoral excellence. Elections Ontario is pleased to report that that the agency has now been awarded the First Time Voter Award in partnership with the Ryerson Democratic Engagement Exchange and the shared youth engagement work conducted with The Exchange during the 2018 general election. Elections Ontario was also awarded the Accessibility Award, the Minority Participation Award, the Electoral Ergonomy Award, and the Election Management Award. This is an international recognition of the hard work Elections Ontario did to deliver the 2018 general election to Ontarians. Elections Ontario recently hosted a booth at the annual Democracy XChange conference. Academics, election administrators, community organizers, educators, and several non-partisan civic engagement organizations convened at Ryerson University to explore democracy in Canada. Everyone gathered to envision future elections and recommit to engaging the disengaged through inclusive strategies. Elections Ontario surveyed conference attendees on potential innovations to Ontario’s elections, and our public education strategies. The booth garnered a lot of attention and blue sky brainstorming from the 400 conference attendees. The Outreach team was at the annual Ontario History and Social Sciences Teacher’s Association OHASSTA-AESHO conference this week to drive engagement by showcasing our educational tools with teachers, consultants, and other educational stakeholders. There was high degree of interest on our ORFV (Ontario Register of Future Voters) followed by multiple requests for school presentations. There were teachers mostly from Ontario, however, the conference sees representation from all across Canada, as well as the United States. OHASSTA provided a rare opportunity to share ideas and tools with educators, other EMBs (electoral management bodies) in attendance, as well as public education professionals. And so do you - because it only works when we all work together. So, have a conversation, express your opinion, listen, vote, agree to disagree, be critical, learn. These things build our future. Every little action works towards something bigger. And every one of us has a say in how we move forward. International Day of Democracy is a United Nations initiative that takes place every year on September 15 to raise awareness of democratic values and principles. The theme for 2018 is Democracy under Strain: Solutions for a Changing World. Find out more on the United Nations website. This year, we want to know why #DemocracyMatters to you. Share a photo or message on social media with #DemocracyMatters telling us why you think democracy is important! On September 14, the Elections Ontario Outreach Team co-hosted the first inaugural “Youth Lead Democracy Awards” in observance of the United Nations International Day of Democracy. The International Day of Democracy was launched in 2008 by the United Nations General Assembly to raise awareness of democratic values and principles. Elections Ontario held the in awards partnership with Ryerson University’s Democratic Engagement Exchange and honoured young democracy leaders who volunteered to promote the June 7th provincial election in a nonpartisan capacity. Elections Ontario’s goal was to first, recognize and award the 85 attendees for their civic engagement work and second, to build on the youth’s capacity to rise as civic leaders in their communities. 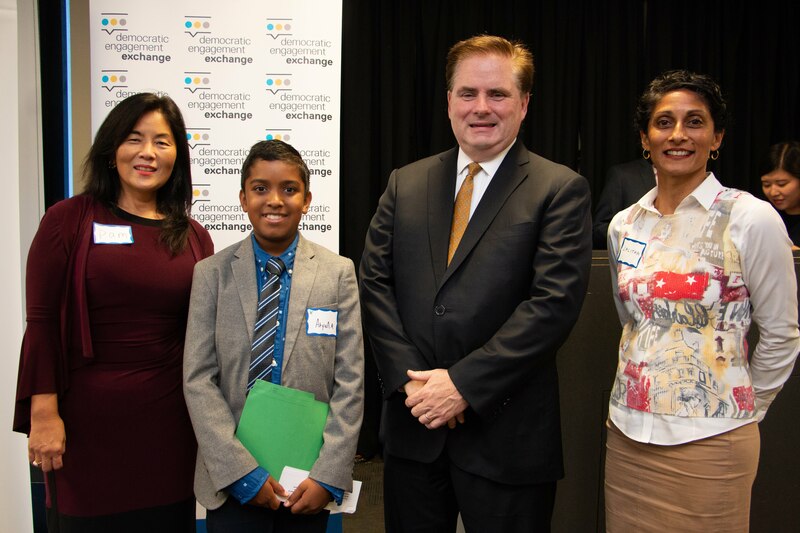 The youngest of Elections Ontario’s honourees was a 12 year old community leader named Aryan from YMCA Youth Leadership Development Program. Aryan delivered the keynote speech titled, “You have a voice, use it!” Aryan embodied all of the talent, commitment, and promise within the crowd that evening. Sign up for our outreach newsletter to stay up-to-date on our activities and receive free, non-partisan information packages during elections! Complete the form below to be added to our mailing list. We don’t share your information with any third parties and you can opt out at any time.